In August 1947, when the British partitioned their Indian colony into two countries of India and Pakistan, the state of Kashmir was being ruled by a Hari Singh one of whose ancestor, named Gulab Singh, had been vested with the state by the British by virtue of the Amritsar Treaty of 1846. 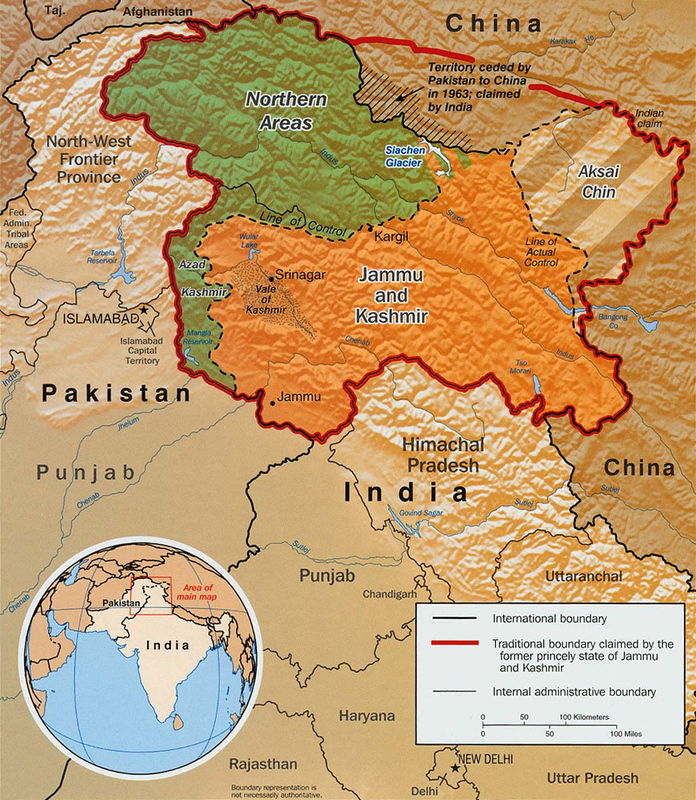 At the time of Partition the ruler of Kashmir signed a status quo agreement with Pakistan, but Pakistan a couple of months later pushed in military-backed armed insurgents into the state, in reaction to which the ruler of Kashmir signed an accession treaty with India, upon which the Indian army was air-dropped in Srinagar in October 1947. In the ensuing war, the Indian army did manage to wrest about three quarters of Kashmir from the Pakistanis. Then in 1948 the Government of India took the dispute to the UNO, pleading that Pakistan had tresspassed on a territory which belonged to India because of the accession treaty, something which had been provided for in the charter of independence of 3 June 1947 which had been agreed upon by both the Muslim League and the Congress. The UN managed to persuade the two countries to do a ceasefire and sort of vindicated the stance of both the countries by calling for the Pakistani troops to withdraw from the entire state of Kashmir and allowing India to keep only as many troops as were necessary to maintain law and order in the state so as to hold a plebscite under the supervision of the UN. Although Pakistan and India both agreed to the UN resolutions, the former never actually expressed its willingness to withdraw its troops from the part of Kashmir it retained when the matter went to the UN, whereas the latter after a while outrightly rejected any third-party mediation. The Pakistani version of events is that the Pakistani tribals went into Kashmir to rid the local Muslim population of the tyranny of the forces of the Hindu ruler of the state and the Indian forces and by dint of their sheer zeal and spirit pushed back the agressors and "liberated" a portion of Kashmir until India, sensing defeat, took the matter to the UNO only to gain time and so kept on putting off the execution of the directives of the international body by not cooperating with the body's emissaries. While the Indian army was managing to repulse the Pakistani fighters on its own, why did the Nehru government feel the need to seek the UNO's arbitration in the first place? Once it became clear that Pakistan wasn't going to pull out its troops from Kashmir, why is it that India didn't continue with the offensive to make Pakistan vacate Kashmir, given that the UNO had backed India's position in this regard anyway? Even before Paksitan became a nuclear power, why was the Indian army unable to wrest Kashmir from the Pakistani army although the former is several times larger in numbers and weaponry? Why didn't India force Pakistan to surrender Kashmir in 1971 when the latter had tens of thousands of its troops in the former's custody after the fall of Dhaka? If India was able to withstand the US or Chinese pressure when it took Pakistan on in East Pakistan, then surely it could have done likewise in the case of Kashmir also. So is it because of the Pakistani army's sheer fighting spirit that the Indian army has been forced to be on the defensive in Kashmir, despite the fact that India is in a dominant position in the Siachin heights too? As one can see on a modern map, the region is contested from three sides, at least. At the time an intervention from the Soviet Union or China would be the least desirable for both Pakistan and India. Support from any other outside force would have had to be indirect, as this region is of difficult geography far from the sea. This limits any potential aid from France, the British or Americans. The role of any other power at the time, represented by being in the UN, would have to be characterised at minimal. On the other hand, economic sanctions for non-compliance could hurt any war effort of either side quite quickly. So the main contestants for the Indo-Pakistani War of 1947–1948 are now described as "Pakistan and India". This gives a wrong impression. The Pakistanis that wielded weapons were small and irregular troops at first. Free-lancers, infantry, guerilla. Equipped, financed and backed in many ways by the regular Pakistani army, but not part of it nor identical to the Pakistani army. When the regular Indian army started their big offensive in early 1948 that provoked the regular Pakistani army to enter the theatre. During Operation Easy tanks were employed for the first time. After about six months of fighting, Indias military superiority began to tell. 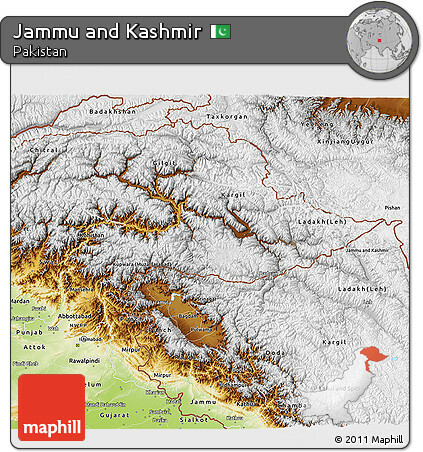 This led Pakistan to commit three brigades of regular troops in April 1948. Pakistan was able to occupy the areas they call AJK partly because it had excellent logistical access from north Punjab and NWFP, and partly because the people theremostly Punjabi-dialect speakerswere more under the influence of the Muslim Conference than Abdullahs NC. Similarly, Pakistan could occupy the Northern Areas (the Gilgit Agency and most of Baltistan) because the area had few roads and they could be accessed better from the Pakistani side. But what Pakistan wanted mostthe Kashmir Valleyeluded it. Indias superior military power and Sheikh Abdullahs grip on the population proved too much. Peace efforts paralleled the fighting. IndiaPakistan meetings were held in Delhi and Lahore from 30 October to 8 December 1947 under the auspices of the Joint Defence Council of the two dominions, but no agreement could be reached. On 1 January 1948, India lodged a formal complaint with the UN under Article 35 of the UN Charter. The UN, then in just the third year of its life, was firmly under the control of the US and the UK. Of the other Security Council permanent members, Kuomintang China and pre-de Gaulle France were closely allied with them and the Soviet Union had yet to become a major international player. After an initial resolution seeking restraint by both sides, the United Nations Security Council (UNSC) passed a substantive resolution three days later, on 20 January 1948, setting up a three-member United Nations Commission for India and Pakistan (UNCIP). Both sides accepted these resolutions. To India's chagrin the trend of opinion in the UN, beginning early February, began to veer towards Pakistans side. The geo-political interests of the US and the UK in West Asia as well as the framing of the issue in Hindu-Muslim terms played their part in this. The UNSC passed its first resolution on the settlement of the Kashmir problem on 21 April. The resolution called for the withdrawal of all Pakistani forces, a minimum presence by India, the appointment of a plebiscite administrator, and finally, plebiscite. Both sides rejected the resolution. On 13 August 1948 the UNCIP adopted its first resolution. Besides calling for a ceasefire, it asked Pakistan to withdraw all its troops and nationals from J&K and India to withdraw the bulk of its forces. It asked both countries to reaffirm their agreement to decide the disposition of the state in accordance with the will of the people. India accepted this resolution in broad terms while Pakistan, in effect, rejected it. Pakistan logically acknowledged the fact that with Abdullahs strong hold over the majority of the states Muslims and the presence of Indian troops in the state, a plebiscite verdict would go against it. In December, both sides agreed to accept the ceasefire part of the UNCIP resolution, and an agreement was signed on 1 January 1949. On 27 July 1949, military representatives of India and Pakistan signed the Karachi Agreement demarcating the ceasefire line up to Point NJ 9842 near the Siachen glacier. Troop withdrawals behind the ceasefire line were completed by 31 October. And Kashmir was not the only region with upheaval and violence during the partition Independence, population transfer, and violence. Such a situation can easily spin out of control. That is further out of control than it did already. strategic considerations from both sides, heavily influenced by international opinion and even more so by outside interests. Both sides being pressured but trying to keep their options for a better time. Not the answer you're looking for? Browse other questions tagged war india british-empire pakistan south-asia or ask your own question. Are there any details available on 1954 Afghan proposal for a merger with Pakistan?